If there is only one thing a parent does to help a child get prepared for school I would say that thing should be how to have a conversation. Parents should have conversations with children. This is not always easy because their parents may not have had conversations with them. Often parents and adults in general talk at children, they give them directions or ask some simple questions. Asking the more open ended questions and continuing a conversation is not always something a parent thinks about doing. And sadly that is the one thing that can really help a child increase their performance in school and ultimately life. With Jayden getting ready for Kindergarten I want to work with him to increase his communication skills and much more. When I was offered to review some products from Super Duper Publications I immediately jumped at the chance. Super Duper makes hundreds of creative and fun educational material. 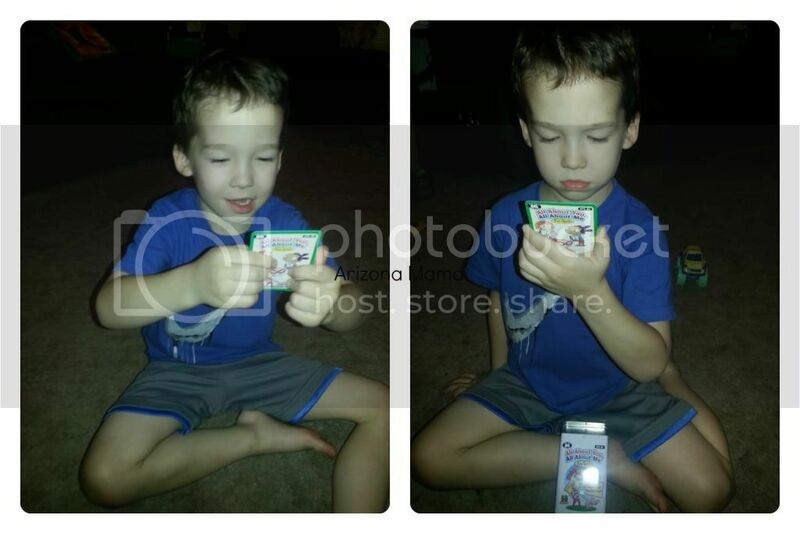 I was sent Lids 'n Lizards magnetic Photo Vocabulary Game, MagneTalk Early Classifying, and All About You, All About Me FunDeck. The Lids 'n Lizards magnetic photo vocabulary game. With this game children can practice articulation, categorizing, describing, as well as auditory and visual memory skills. All you do is place a magnet under each of the lids and let the fun begin. Players will name the photo object on the magnet as they flip the lids. And the fun is when they flip a lid and there is a colorful lizard under it as a surprise. The player to uncover the most lizards wins. There are a few ways to go about this game. The player can simply name the object on the photo magnet, describe it, categorize it, and more. The game comes with 10 magnets for each of 5 categories including food, transportation, animals, clothing, and around the house. You can choose to place a single category under the lids or mix and match them. When I got this game out for Jayden he loved it. We started with just naming the items under the lids and then named and categorized them. We played this game over and over. He even wanted me to hide so he could hide where the lizards were. In addition to all the great vocabulary learning we would count the lizards collected at the end to add in a little math skills. I really like all the possibilities of this game. The game comes with a great selection of magnets and more can be added. For younger ages you could make your own magnets with letters to teach letters and letter sounds, numbers, or shapes. For children with speech delays you could place items that begin with the sounds they are working on. 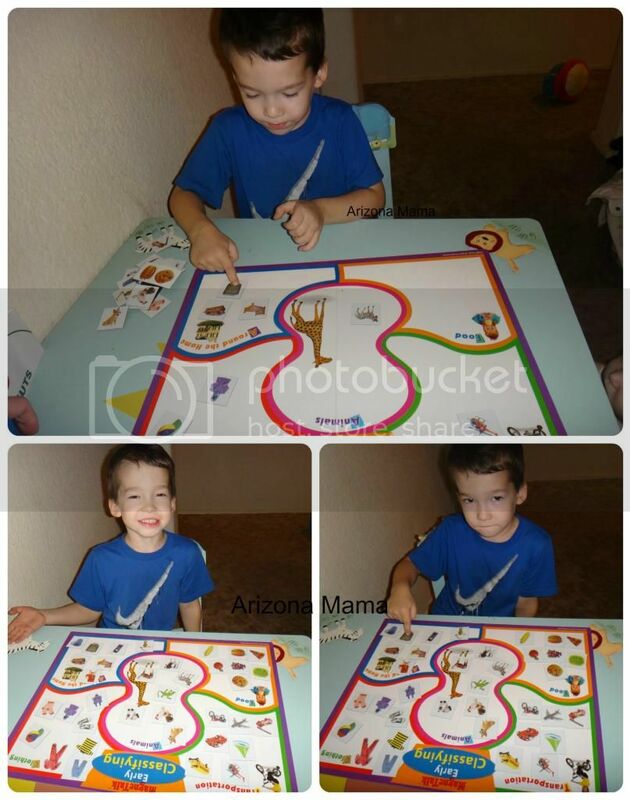 This game is great for home, school, and speech therapy. The second game we received was MagneTalk Early Classifying game. This is a simple and fun game. The whole board is magnetic. The board is drawing to divided into 5 categories, transportation, clothing, animals, food, and around the home. Some of the skills that children can work on with this game is classifying, vocabulary, critical thinking, and fine motor. There are 35 magnetic tiles, 7 for each category. We played this game a couple different ways. First I just had Jayden take each magnetic tile, name the item and place it in the category it belonged to. Next we placed them all upside down and together we each picked an item and named it then placed it in the category on the game board. Another time we played we identified the item and named the category it belonged to as we placed it on the board. This game also has more possibilities such as describing the items or adding items. Even with this such a simple game Jayden had lots of fun playing. I loved talking to him about the different items. And one of my favorite things was when he at first placed pizza in around the home. I asked him why he thinks it goes there. He said, "because you have to eat it in your home." I think he totally made sense, but we then discussed if there was a better category and that is when he remembered there was a category for food. We decided it goes in food, but that the food also goes in around the house. This game is also easy to clean up and store. The third game we received is the All About You, All About Me Fun Deck. This is a deck of 56 cards with questions to help your child talk about themselves. The deck includes some basic questions, open-ended questions, content cards, and some game ideas. These cards can be used one on one or as shared as a group. The cards all store in a sturdy storage tin. I pulled out this fun deck when Jayden wanted to play a game. I started by randomly pulling out a card and asking him the question on the card. He was so cute just making up things like when asked about "What do you do after school? And how do you get there?" He told me he rides the bus, which isn't true, but he has always wanted to ride a bus. Jayden then grabbed a card and made up the question as he asked me. Next Jayden pulled a card and asked me what it said. I told him and he went over to his daddy and "read" the card. He just repeated what I said as he looked at the card. I love when he pretends to read. John was game and answered the question and then threw it back at Jayden and asked him the same question. I really like that this game can be played anywhere. We could even play in the car. We are planning a vacation trip to California soon and when we go we will be driving. I am going to take this deck for something fun to do in the car as we drive. It is small and takes up so little room too. I might just put them in my purse for those emergency situations when I need something to keep Jayden busy. This game is also an app that you can add to your iphone or android phone. Something I really like about all these games is that the instructions are printed right on the inside of the box lid, on the back of the game board and in the deck. This may seem little, but I really like that this helps to keep from losing the instructions. Those paper flyer instructions often get torn or lost. Super Duper has so many great educational games. There was another game that was offered to me, but it was out of Jayden's age range. It looks like a great game for older children, it is called TopicTalk Conversation Card Game. This is a game I will keep on my list for when Jayden gets a little older. And one last think.. Super Duper has Free Shipping to USA and Canada on all orders over $20. Discount Code: Currently you can save 20% when you use the code BETTER on orders over $20, plus you get free shipping. But hurry this offer ends May 31, 2013. 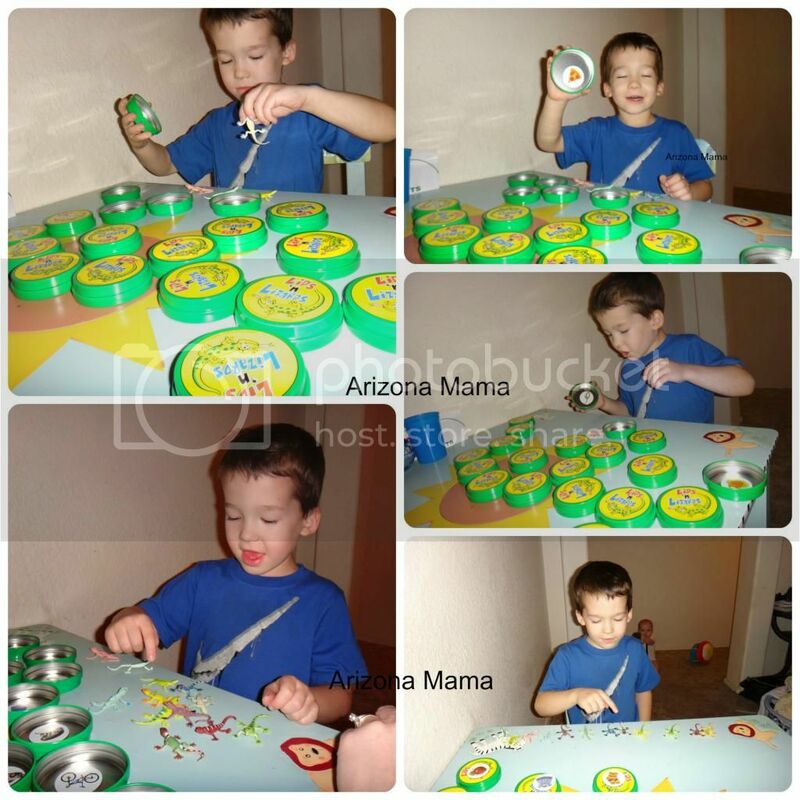 Win it: One (1) Arizona Mama reader will win their choice of one (1) game: All About You, All About Me Fun Deck, TopicTalk Conversation Card Game, MagneTalk Early Classifying, OR Lids 'n Lizards Magnetic Photo Vocabulary Game. Enter in the Rafflecopter form below! This giveaway will be open until 5/31 at 12:01AM (EST). Open to US and Canada. I love the Photo Classifying Flips. These have been a great tool in helping my son with his speech therapy. The lids n lizards looks awesome! I think my boys would really like that. I checked out their website and also like the Word FLIPS. I might choose the Lids 'n Lizards Magnetic Photo Vocabulary Game. I also like their MagneTalk Match-up Around The World. I would choose their MagneTalk Early Classifying. I learned that they have a section dedicated to Autism. I would pick the Lids 'n Lizards Magnetic Photo Vocabulary Game, I'll be able to focus use of this game with all three of my grandchildren. We would pick the All About You game if we won!! I like the Sentence Fill-in Fun Deck. Very awesome! I would pick the Lids 'n Lizards Magnetic Photo Vocabulary Game. Wow, they have so many learning resources. I'll have to remember them when I start homeschooling. I like the Question Challenge Card Game. I like the Webber® Photo Lotto Games. I would choose TopicTalk Conversation Card Game. I would choose the Lids 'n Lizards Magnetic Photo Vocabulary Game. It looks fun! I think the Ask and Answer WH Cards and CD Rom in spanish would be cool to teach my son Spanish. Probably the "All About Me, All About Me" deck of cards. I also love the sign language card kit. I would love to have Topic Talk if I win.